Holy Moses, it has been a hell of a week here. 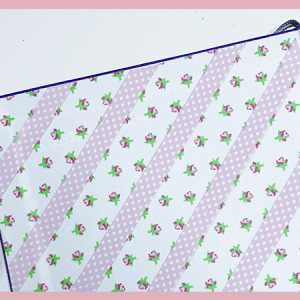 I meant to have this up on like Thursday, and here it is, Easter Sunday! You probably know this already, but I’m slightly addicted to Instagram. By slightly I mean I have a problem. Like I wake up to my 6-month-old crying at 3AM, and I have to check Instagram to see what’s new. Don’t worry, I feed my daughter. We all have our priorities, and I don’t want to be judged for mine. 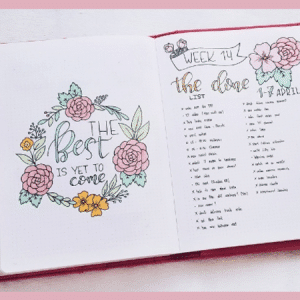 As a result, I’ve come across a number of bullet journal challenges that I can’t wait to share with you. If you aren’t familiar with Instagram challenges, have a look at my Doodle Challenge post to get an idea of how we do. 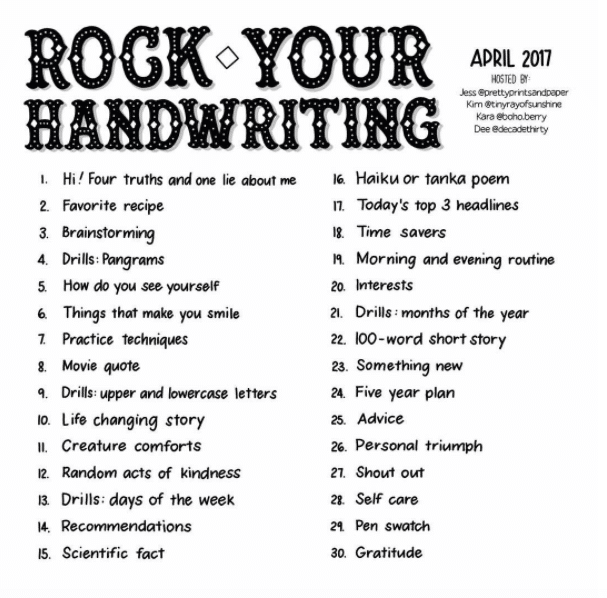 This month I am participating in two Instagram challenges: MY Oodles of Doodles Challenge and the infamous #RockYourHandwriting Challenge. Both are fun, and I’m seeing lots of improvement in my doodling abilities and everyday handwriting. If you haven’t participated in one of these challenges or you don’t have Instagram, first off, get an Instagram account. Even if you just ooo and ahhh over everyone else’s photos and never post your own, that’s totally okay. But for real, it’s my favorite social media platform. Getting back from my tangent, if you haven’t participated, you should browse through these suggested challenges and pick one to try next month. If you think it’s pointless or a waste of time, you’re wrong. Doing a minor task every single day for 30 days can drastically improve your skills and abilities. It’s also a great way to give your creativity a boost because you’re forced to think about the prompt for then respond based on how you perceive the prompt. There’s no right or wrong way to respond. There’s no competition. It’s all in fun and to an easy way to stimulate the right side of your brain. This is my (@the.petite.planner) monthly doodle challenge, and it’s gaining traction quickly. In March, the doodles were totally random, but in months moving forward, I’m going to keep each month a theme. 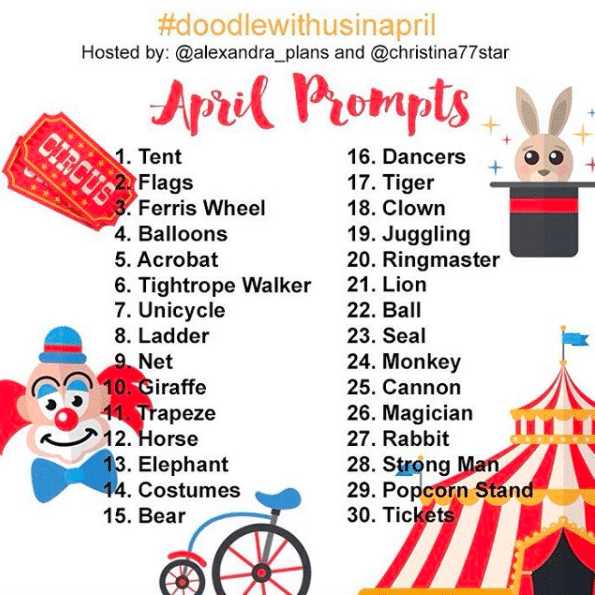 Doodle with Us is a monthly doodle challenge hosted by @alexandra_plans and @christina77star. 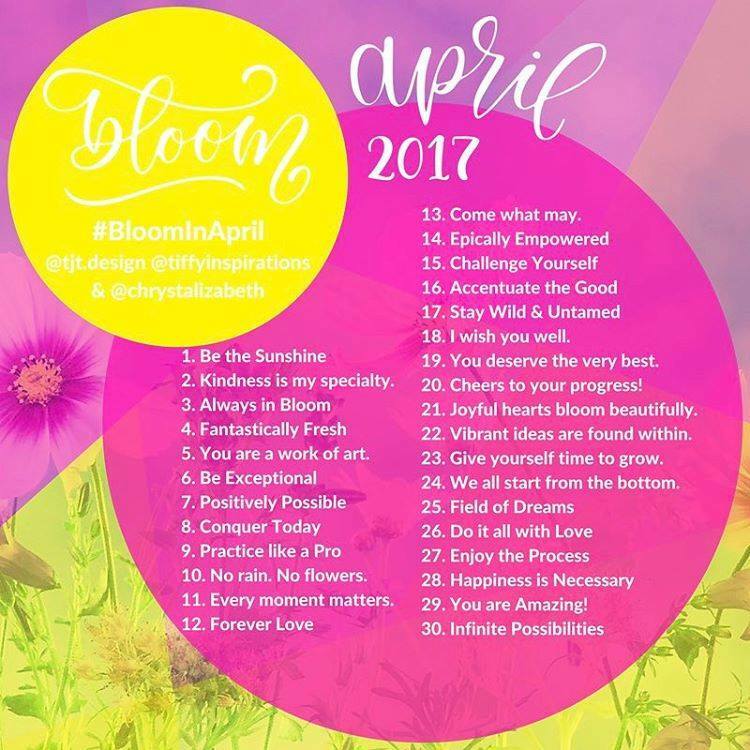 They stick to a theme each month, and they encourage participants to make one large drawing out of all the smaller prompts. You certainly don’t have to do it this way, but it adds to the challenge. EDIT:2/16/2019: This user is no longer on Instagram and as far as I can tell, no longer hosts these challenges. 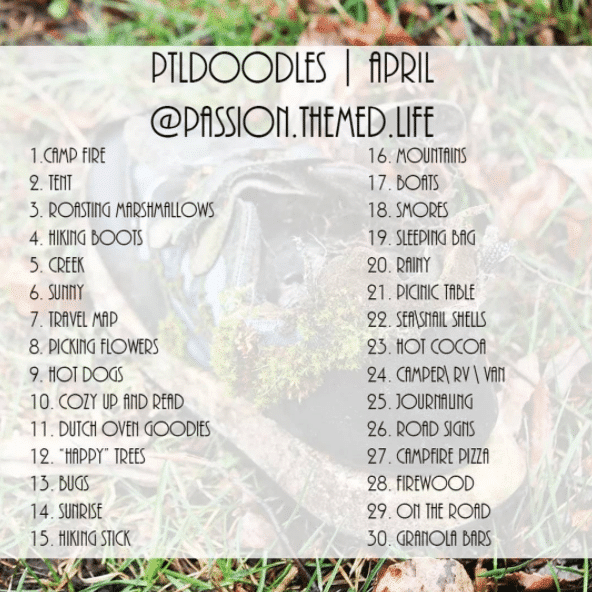 This is a great doodle challenge, hosted by @passion.themed.life. 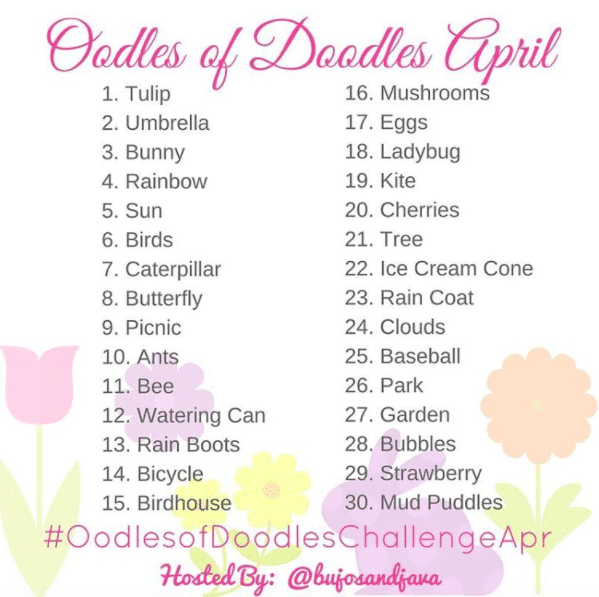 Like the others, it sticks to a theme each month, but she always uses very creative and fun prompts and there are tons of people who join in, so it’s a lot of fun to use the hashtag #PTLdoodles and see what everyone else is doing. 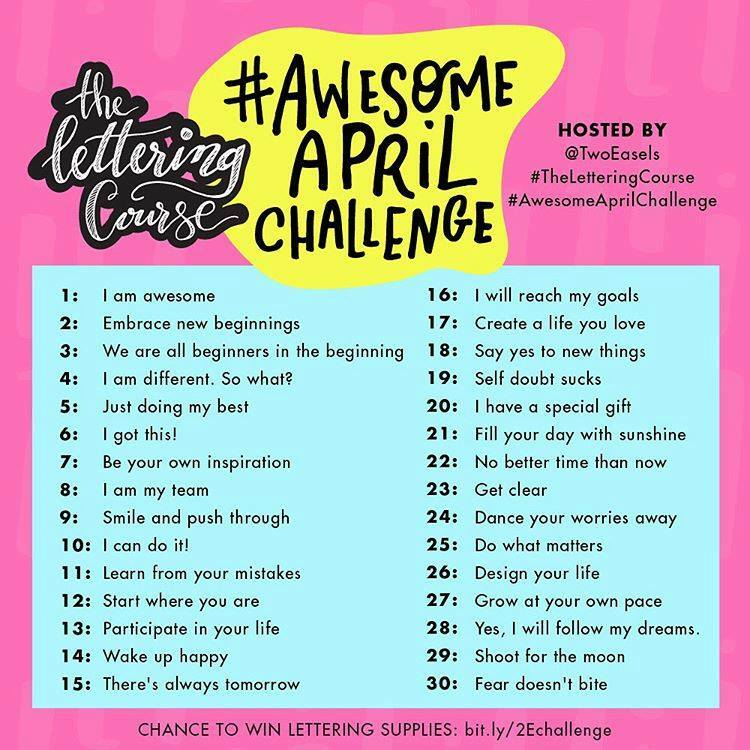 This lettering challenge hosted by @chrystalizabeth @tiffyinspirations and @tjt.design is great for anyone who wants to work on their brush lettering skills. The daily prompts are exactly what you write, and you can always check in with one of the hosts to see what they’re doing for the day. Use their hashtag and you may even get a feature. I’m participating in this challenge for the first time this month, and I’m loving it. It’s hosted by @boho.berry, @decadethirty, @tinyrayofsunshine, and @prettyprintsandpaper. These ladies are all fabulous and regularly post their own work for the prompt of the day. Again, there’s a lot of engagement here and tons of inspiration from others if you feel lost. This is another brush lettering challenge, hosted by @TwoEasels. 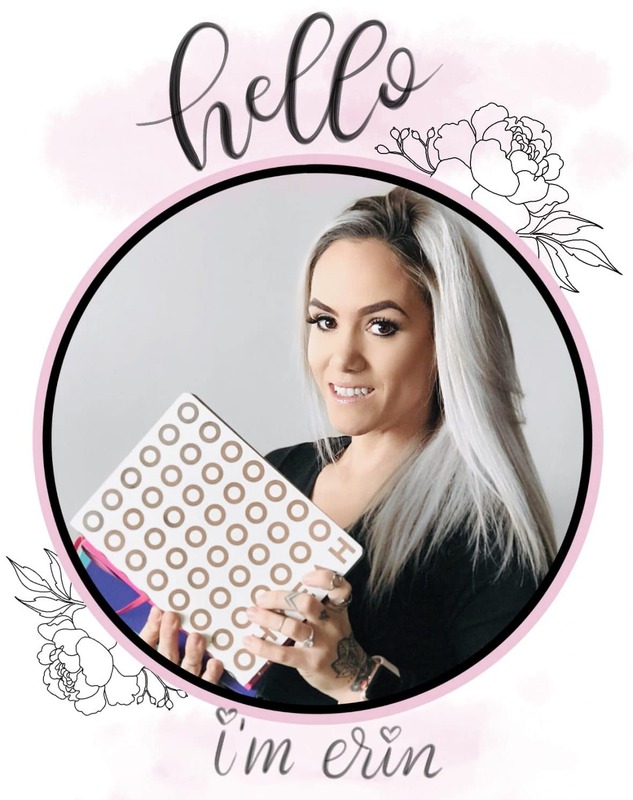 She is an extremely talented and knowledgeable lettering artist, and she’s always sharing tips and tricks to improve your lettering. I highly recommend following her and participating in this challenge. Sometimes she even offers her participants the chance at prizes. 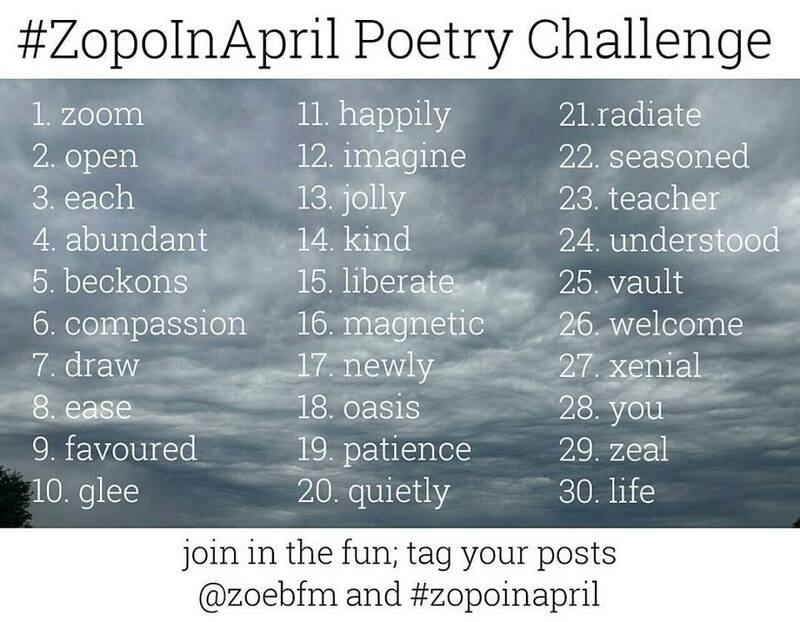 If you are up for a good challenge, try this poetry challenge hosted by @zoebfm. She does the challenge right along with you and posts her response to the prompts each day. This may be a bigger time commitment but it’s well worth it. 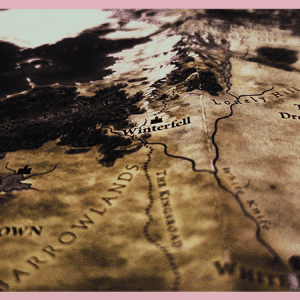 Want a writing challenge, but not something that’s going to take up tons of space or time? 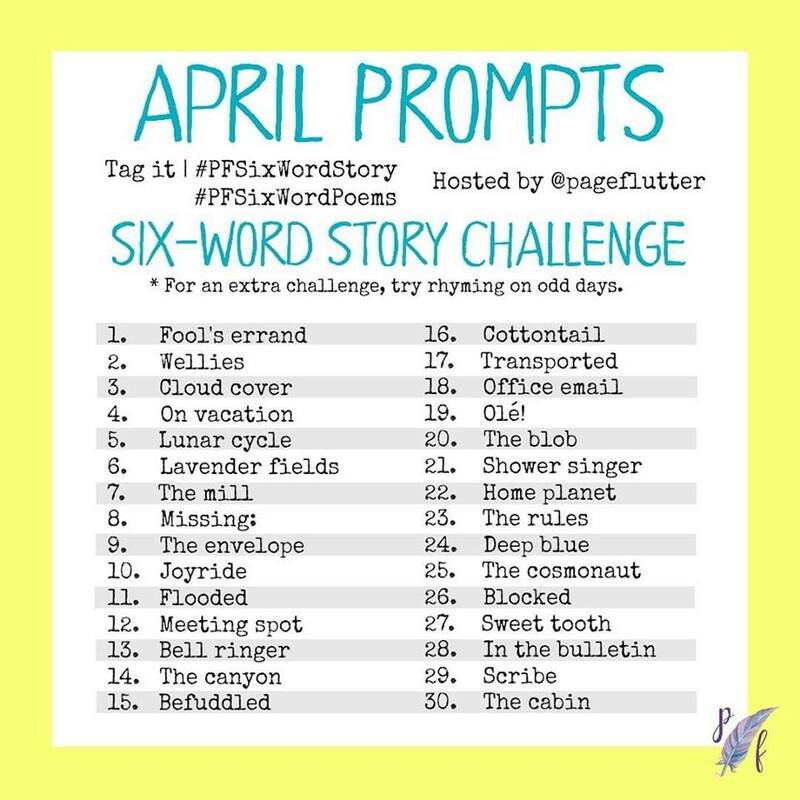 The Six-Word Story Challenge by @PageFlutter is a super fun and creative way to put some words down on paper each day. I haven’t done this one, but it’s on my list for May. I’m filling up a page in my bullet journal with a list of monthly challenges I would like to participate in, and I highly suggest you do the same. Don’t overwhelm yourself; pick one challenge a month and stick to it each day. I think you will find that 1). you enjoy it and 2). you improve your skills and creativity. You do not need Instagram to complete any of these challenges. You don’t have to post your work for anyone to see if you don’t want to, so please don’t shy away because you don’t use social media or don’t feel comfortable sharing. Do it for you and you alone. Enjoy it and use it as a tool. It doesn’t have to be a public event.